What do women really want? Chocolate! But you already knew that, right? 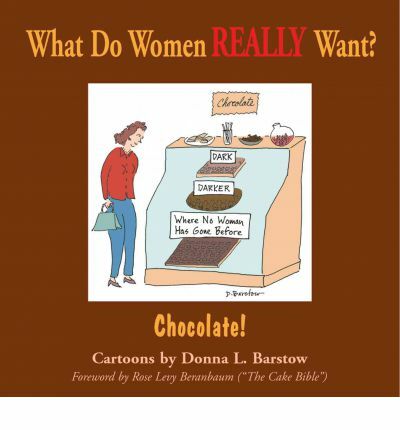 Everyone knows the delicious anticipation of dipping into a fresh box of chocolates...and so it is with this charming collection of cartoons by New Yorker cartoonist Donna Barstow.Chocolate is on the minds of many ladies most of the time, and we're lucky that cartoonist Barstow has been willing to share her own obsession with it. Why do women crave it, anyway? Why is it more important than love? How many uses can one find for it? These and other questions may be answered - or not - in these cool cartoons about women and their not so secret madness.Ranging from "laugh out loud" to "I gotta send this to a friend," the over 120 drawings here are New Yorker-type cartoons with a distinctive girly slant. The pen-and-ink line drawings with wash are reproduced well in this medium-sized hardcover. Quotations on chocolate from authors like Mel Gibson to George Bernard Shaw are also included, and an amusing foreword by Ruth Levy Beranbaum (author of "The Cake Bible,") proves she's a chef who can laugh at her own delicious words.Chocolate! is the perfect gift or collectible for foodies, cartoon lovers, and, of course, collectors of all things chocolate.